Cher has apologized for upsetting her LGBTQ fans by posing for a picture with Australian Prime Minister Malcolm Turnbull. The Believe hitmaker met the Australian leader at the 40th annual Gay & Lesbian Mardi Gras parade in Sydney over the weekend (March 3 & 4) and he posted a picture of the pair on his Twitter page. "Welcome to Sydney, Cher! @GladysB (fellow politician Gladys Berejiklian) Lucy (his wife) and I and all your fans thrilled to be with you at the 40th Mardi Gras & first since Australia achieved marriage equality," he wrote. However, after he uploaded the picture, many of Cher's fans took to social media to educate the singer, insisting that despite gay marriage recently becoming legal in the country, Prime Minister Turnbull is not a friend of the LGBTQ community. 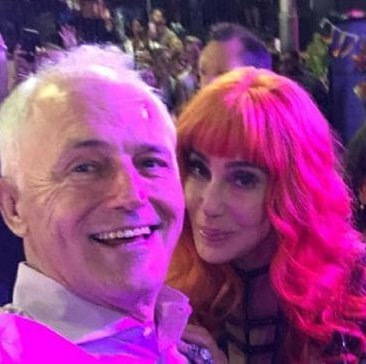 "I wonder if @cher knows just how truly terrible @TurnbullMalcolm and his party have been to the LGBTIQ (lesbian, gay, bisexual, transgender, intersex, and questioning) community..." one user wrote. "Hey @cher ..I love you but, did @TurnbullMalcolm tell you he has a whole review being held to enshrine discrimination again the LGBTIQ community?? ?," another person wrote. Cher subsequently responded to the controversy, insisting she was unaware of Turnbull's political history, but was hopeful he has since become more accepting of modern lifestyles. "I'm not sure what you mean," she responded. "The Man I Talked To Seemed PROUD OF EVERYONE AT THE PARADE. Am I Missing. Something?? The Man I TALKED Could Be Reasoned With,The Man I Talked TO Believes In Equal Rights for ALL OF HIS PPL (people). THE MAN I TAKED (sic) TO WILL LISTEN & HEAR COMPASSIONATE (sic)." "School me.....," she added. "I have a little fight Left. I told him how I detest (U.S. President) trump....trump values NOTHING & NO ONE?? Can your prime minister LEARN Your Value?? Can He Minister To you?? If He Cant, you owe him No Allegiance, If He Can Be turned around,TRY (sic)." However, Cher is now apologising after learning more about Turnbull from her fans. "Am so sorry," she tweeted. "Guess that's why I have FEW Friends Who Are Politicians. He Seemed Very Open & excited about MARDI GRAS, AND LGBT COMMUNITY."